With it being the first week of February it’s hard to not be all into the lovey dovey feelings more than usual. For this Wedding Wednesday we are going to check out Bryan and Erin’s beautiful September wedding with burgundy, blush and gold colors in Bloomington, IL. Erin and Bryan were friends at first and over time their love continued to grow and bloom into the beautiful love story that they celebrated on that September day. Erin and Bryan met through their mutual friends. Bryan says he knew 2 months into their relationship that Erin was the one. He drunkenly confessed his love for Erin and that he was going to marry her when they were at a Jason Aldean concert. Erin knew that Bryan was a special one on their first date. She was still living at home at the time; he picked her up at Erin’s parents house and came up to the door and met her parents right away. 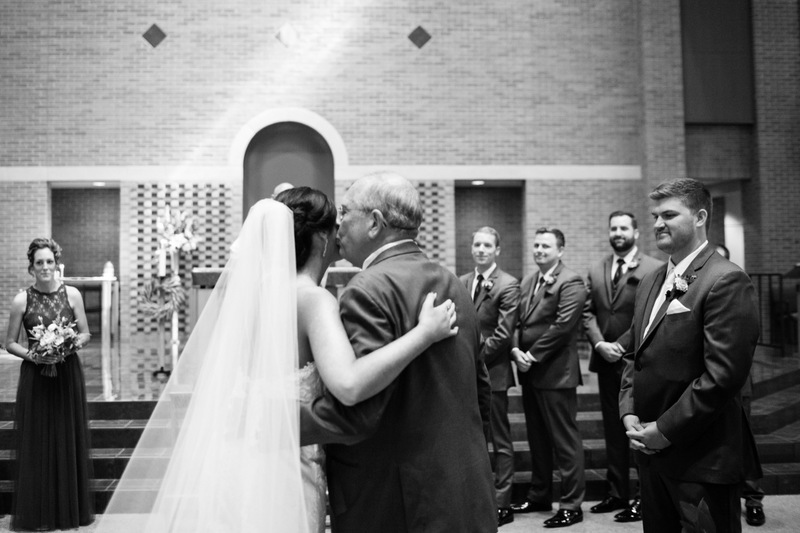 Erin’s dad was incredibly impressed with him and Erin knew he was going to be a keeper. The color theme for Erin and Bryan’s big day was burgundy, blush and gold. This created a classic and elegant look. These colors were present in the bridesmaid dresses, the bouquet and tableware/decorations. When asked what they were most excited about for their wedding Erin said “I’m excited to see the reception ballroom all put together with all of the flowers and decorations that are being planned”. Bryan said he is most excited for the cake and cupcakes; because he has a sweet tooth. Erin and Bryan’s goofy side really shown through their pictures and it’s clear to see how much fun they had on their wedding day. If you loved this post you will also want to check out Bridget and Nathan’s Chicago Lakefront Wedding.